One of our specialized range of products are designer lehengas that are known for their great design, intricate embroidery work as well as exceptional color combination wherever variety of colors are used. Our Designer Lehenga are designed keeping today's trend in mind. The lehenga is elegantly designed with zari work and net fabric in design to give a sleek look to the outfit. We present our Ribbon Work Saree that are unique in look and are created with precision by our proficient designers. We bring an elegant range of Designer Sarees that can be worn on various occasions like weddings, parties etc. Our Designer Lehenga are designed keeping today's trend in mind. The lehenga is elegantly designed with zari work and net fabric in fish cut design to give a sleek look to the outfit. 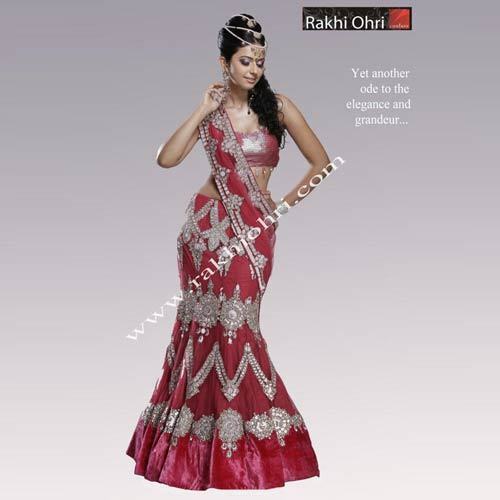 Fish Cut Lehenga is specially designed for marriage function purpose. The colour and design is as per the new fashion trend. The net fabric is soft and easy to wear and handle. We provide Bridal Lehenga, which is embellished with heavy embroidery, mirror, sequin, beads, stones and other decorative works. Designed exclusively for wedding occasion, our range is available in vivacious color combination and prints. These can be customized as per the specification of clients. 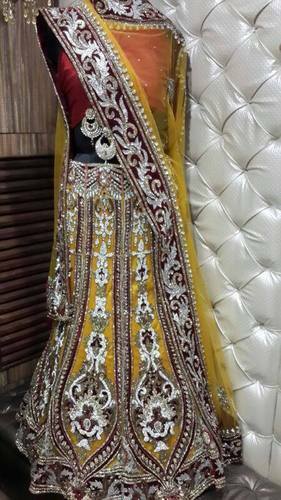 We provide Bridal Lehenga, which is embellished with heavy embroidery, mirror, sequin, beads, stones and other decorative works. Designed exclusively for wedding occasion, our range is available in vivacious colour combination and prints. These can be customized as per the specification of clients.